After the upgrade, the membership signup and renewal process is broken in the following way. The signup/renewal form at https://oaem.ca/civicrm/?page=CiviCRM&q=civicrm/contribute/transact&reset=1&id=1 now includes an additional "Organization Details" form, which is not set in any profile, and which is not wanted. It appears to conflict with the membership data that I want to collect, and which is collected using a custom contribution profile. Organization Name is a required field. Phone (Main) is a required field. Email (Main) is a required field. State/Province is a required field. So the additional data on the 1st screen does not get passed to the final screen. This persists even if I switch off the the custom profile form in an attempt to use the 'default' form which is being added. Any suggestions as to what is wrong and how to fix it very gratefully received. This may all be stuff you already know. you should see that you have 'allow individuals to contribute 'on behalf of' an organisation' ticked. And below that it should specify the Organisation profile in use. You can either Edit it via that page, or go direct to Profiles. NOTE: at civicrm/admin/uf/group?reset=1 it may be on the Reserved Profiles tab, which might be why you aren't seeing it. on the page at https://oaem.ca/civicrm/?page=CiviCRM&q=civicrm/contribute/transact&reset=1&id=1 I do not see the 'on behalf of' checkbox which I do see on your old screenshot - is that because you have now made it required? Not the answer you're looking for? Browse other questions tagged civicontribute civimember custom-fields or ask your own question. 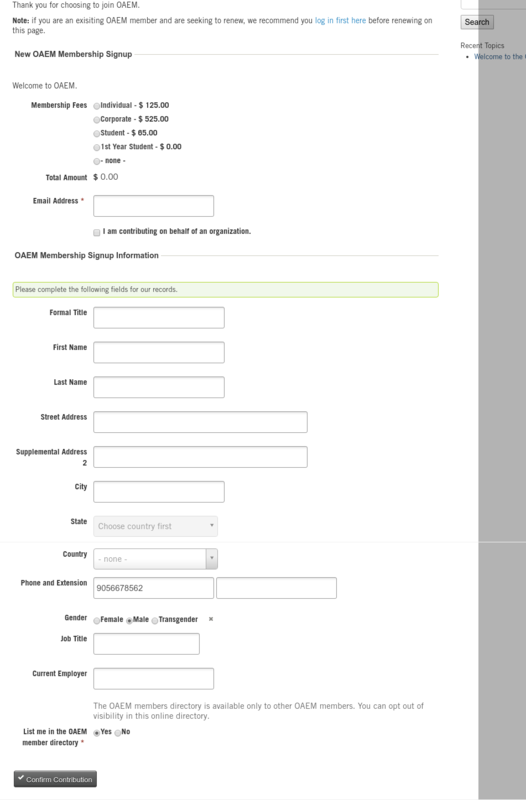 How to make a membership renewal form pre-filled with last year's values?